Each year, the event unveils a surprise theme paying tribute to the things that make our city and our country great. Most recent themes have included “Famous Hot Spots”, “Notable New Yorkers”, “Parades of the City”, and so much more. This year's theme is “Magazines”. 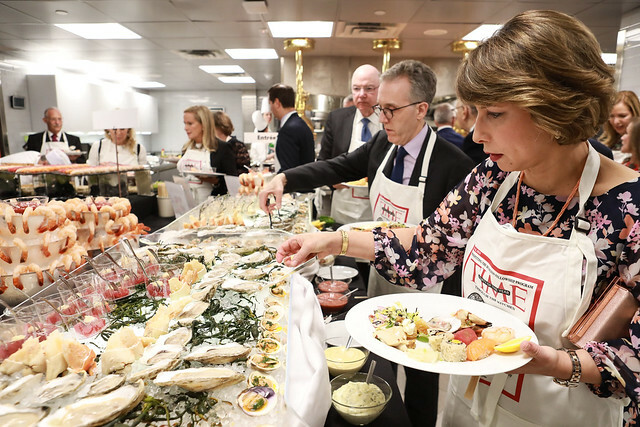 Since Through the Kitchen’s inception, the event has raised more than $17 million to fund promising young scientists focused on studying the immune system and its power to conquer cancer. Former fellows funded through the Cancer Research Institute’s Irvington Fellowship Program have gone on to win the Nobel Prize in Medicine and head major research centers and laboratories at top universities throughout the world. These scientists and doctors have made remarkable discoveries and have pioneered lifesaving new treatments for cancer and other diseases. This is the only charitable event for which guests are invited to walk “through” the kitchen at the new restaurants in the Seagram Building, The Pool & The Grill. The event will take place on May 6, 2018, cocktails at 7:00 pm and dinner at 8:00 pm. Cancer Research Institute is holding an art auction featuring works by contemporary artists. The live art auction begins on May 6 at 9:20pm ET. Register by May 5 at 6:00pm ET. In addition to the works by Ed Ruscha, Anni Albers, Pat Steir, and Fred Tomaselli, a Bloomberg Internship, Private Party at The Grill, and Studio Visit with artists Ilya and Emilia Kabakov will also be auctioned.